What name comes to the mind when someone mentions Indian Advertising? 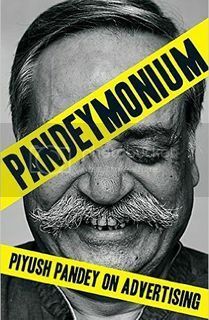 Piyush Pandey. The award winning head of Ogilvy and Mather and now the recipient of the PadmaShri, Piyushhas proven again and again that he is the go-to person for ideas and fresh thinking. The book begins with a song, in a typical piyush style, and starts right from his early school days in a hilly northern indian place to his rise in the advertising world. The book talks about his roots, how these roots helped him develop the wings and his eventual rise. The book is written by Anant Rangaswami and in the very beginning it is mentioned how after a lot of convincing and a couple of weeks of solitude in Goa, the book turned into reality. The narration of the book is simple and makes the reader feel like he himself is there in the scene as a mute spectator. The events come out live and being from the same industry, most of the situations elaborated here are pretty everyday scenario’s. One quality of Piyush that stands out throughout the book is his candid confession again and again that most of his ideas are directly lifted from the happenings around him. Be it his wife Nita, or his father for the fevicol ad. Makes one think that every small incident that has ever occurred in our lives probably comes back in some way given that we retrieve it from our memory at the right time. Though touched in a short chapter, the section on the importance of research in creating advertising excited me the most. Piyush hits the cat’s bell when he says, “If you ask stupid questions, you would get stupid answers” pertaining to consumer research. At the same time, without brandishing research at all, he reiterates its importance but stresses on the need to evolve the methods. I am sure many readers would wish there was more on this here. Also, Piyush has been known in the industry for this, and the book only proves it again – give credit where due. Right through the book there are references to countless people for each of the campaign that shows the right team spirit expected from a leader. There are places in the book where it feels like a PR machine for O&M, the agency that Piyush has been associated with forever. Also, somewhere the entire book feels like an acknowledgement section or a literal version of an awards acceptance speech. I guess with multiple decades of work being described in a book, such pitfalls tend to become unavoidable. Overall, the book is like a face to face interaction with the man himself and is a must read for anyone with the faintest interest in advertising in India.